"International league of manufacturers of equipment for industrially hazardous objects" – autonomous non-commercial organization, founded in May 2004 (registration certificate No.1045007905766 dated 26.05.04), is voluntary association of handling machinery manufacturers and suppliers to the Russian market for the purpose of coordination of its members activity, representation and protection of common interests in sphere of its professional engineering activity, handling machinery manufacture and marketing (hoisting cranes, hoists (towers), lifts, escalators, cable railways, building site hoists and so on), as well as for implementation of integrated technical policy aimed at improving quality and safety of the handling machinery. The system voluntary certification of products in the field of industrial safety has its own form of a certificate of conformity and a mark of conformity. 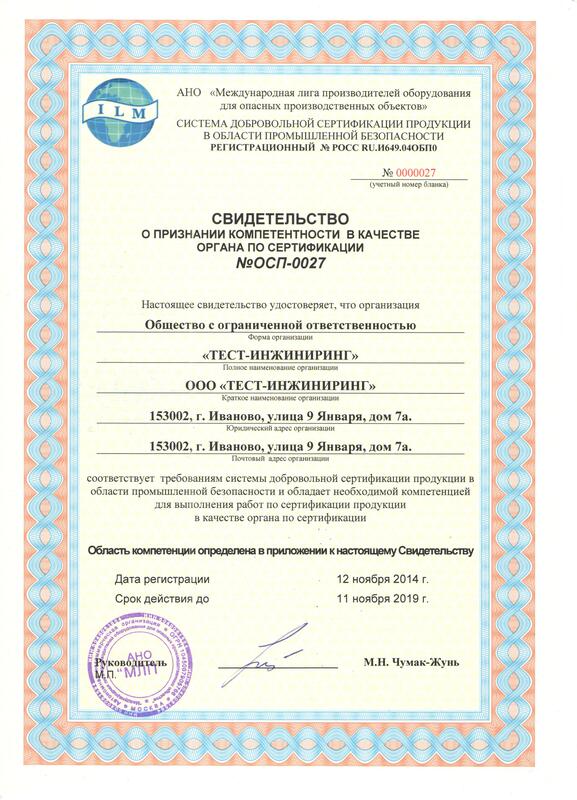 Being accredited in this system Certification Body with Testing Laboratory «TEST ENGINEERING Ltd.» certifies such hazardous production facilities as lifting facilities, boiler inspection objects for compliance with requirements industrial safety. The main purpose of certification in this System is to provide the consumer with guarantees that certified products comply with industrial safety requirements set forth in regulatory documents.